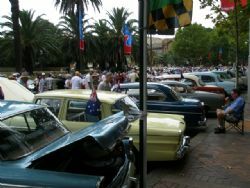 This year’s Australia Day NRMA Motorfest did not disappoint with a huge turnout of classic cars and a massive crowd to take in all that was on offer. With the Festival of Sydney in full swing and the usual numerous events on the harbour coupled with a gamut of kids entertainment in Hyde Park there was something for everyone. An overcast, dull sort of a day was lightened up considerably by the classics ranging from Model T Fords through European exotics to all the local marques including Leyland P76’s. Motorfest offers enormous variety and as well as a thousand plus classics in attendance there are military vehicles, race cars, buses, trucks and a superb collection of restored fifties and sixty caravans. These vans, coupled to cars of the era and parked down Macquarie Street are always popular with the crowd and plenty of overseas tourists were having photos taken standing beside them. Lots of the local car clubs were in attendance and many were well represented both in numbers and quality of cars on display. 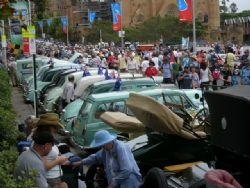 The 48 & FJ Holden Owners Club of NSW had over 20 cars lined up College Street alongside the Early Falcon Club. 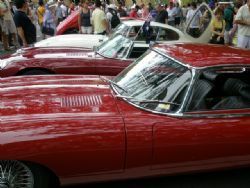 On the intersection of College and Macquarie streets the Jaguar Car Club had a wide range of cars on display with the pristine row of E Types attracting many admirers. There were a number of marques having anniversaries this year including the British maker Morgan celebrating 100 years. There were a lot of classy Morgan’s in attendance spanning all models and most years. The Hudson also has been around for 100 years and the rare Bean car has notched up 80 years with examples of both marques on view in Macquarie Street. A solid showing of Morries marked the Mini Minor 50 year anniversary with some exceptional examples in attendance. With the current economic climate and doom and gloom predictions it was great to see so many owners out enjoying their cars and the day. Over the last few years there have always been a few cars with a For Sale attached and I was interested to see if there would be a lot more this year. To my surprise, they were few and far between with only three signs spotted amongst all the cars. 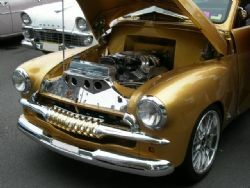 In 2010 the NRMA Motorfest chalks up its 25th anniversary so make some plans to be in Sydney on Australia Day because with all the entertainment on offer throughout the city, the cars and festivities there truly is something for every member of the family.